A soul-spiritual reconstruction of the fundamental importance of the Solar Christic Spirit of John, which remembers him on this day. 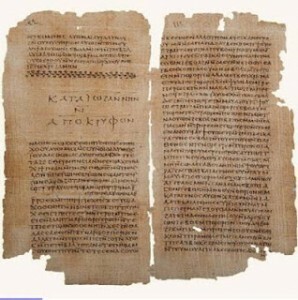 Detaching and emphasizing, in this writing, with other texts of historical nature, the revelation handed down to us by our beloved Master´s Apostle. Suddenly, while I was contemplating these things, there it was! The heavens opened and the whole creation shew a highly light, and the world trembled! I was afraid, but there it was! A small child appeared in front of me in the light. I continued to look at him as growing old and then changed again, becoming as a young man. I could not understand what I was seeing, but the similarity was shown in various forms of light, and these similarities appeared through each other and the vision had three forms. The One governs all. Nothing has authority over him. He is the God and Father of all things, Holy. The “invisible” over all. It is pristine pure light, where no eye can look. The One is “invisible Spirit”. It is not right to think of it as a God or as God, is more than just a God. Nothing is above the One. No one governs the One. From the moment everything exists within the One, does not exist in anyone. Since the One is not dependent on anything, it is eternal. It is absolutely complete and that´s why the One doesn’t owe nothing to anyone. It’s the perfect light . The One is boundless, nothing exists outside of its confines, the One cannot be investigate nothing exists apart from its truth. The One cannot be measured because there is nothing external to what extent it. The One cannot be seen, because no one can imagine it. The One is eternal because it has always existed. The One is inconceivable because no one can understand it. The One is indescribable, because no one can put all the words on it. The One is infinite light, Purity, Holiness, Immaculate. The One is incomprehensible. Perfectly free from corruption. It is not “perfect”, it is not “holy”, not “divine”, but above all these concepts. No material or immaterial, or huge, or infinitesimal. It is impossible to specify in quantity or quality because the One goes beyond knowledge. The One is not a being among other beings. It is far superior, but it is not “superior”. It is outside of the realms of Being and Time. All that is within the realms of Being has been created and everything that is in time has been assigned to it. The One does not receive anything from nothing, but simply learns itself in its own perfect light. The one is majestic. The One is the immeasurable majesty. Incommessurable Head of all realms. The Creator of all kingdoms. It’s The Light. Creator of Light. Creator of Life. It´s bliss. Creator of bliss. It is Knowledge. Creator of knowledge. It’s good. Creator of generosity. Is Mercy. Creator of mercy. Is Generouse. Creator of generosity. (And do not “own” these things) emits light out beyond measure, beyond comprehension. (What can I say?) The One´s reign is eternal, peaceful, quiet, rest, first of all. The One is the head of each realm supporting each of them through the generosity. Q) So we can say that we are living in the Apocalypse. Let’s be clear: John’s spirit is NOT … CHRIST! But through his solar CHRISTOLOGY, his PERFECT KNOWLEDGE OF DIVINE LOGOS CHRIST, we can be lead to the threshold of the GLORIOUS FATHER … ! “IT IS TRUE WHAT THE LORD SAID THROUGH THE MOUTH OF HIS SERVANT.”I HAVE CHOSEN MANY CONTRIBUTORS AT THE TIME OF CREATION, SHOWN BETWEEN THE SPARKS OUT OF ME, AMONG THE MAIN, THERE WAS JOHN, WHO SHOULD REPRESENT THE ENTIRE HUMAN CREATION. You will ask: WHAT IS THE CONNECTION BETWEEN JOHN AND HUMANITY? MY GREAT LOVE FOR ALL HUMANITY ‘, REPRESENTED BY SPARKS GIVEN, WAS TO BE CONCENTRATED IN JOHN, SO FOR WHICH ONLY EXISTING HIM HUMANITY CAN EXIST. SO THAT WAS NECESSARY BECAUSE THE CREATION, AS AN ACT OF PURE LOVE, NOT ALL THIS LOVE COULD donate DIRECTLY TO MY CREATURES, AS MUCH AS A CREATION SHOULD BE GOVERNED AND GRADUATED FROM A PERFECT ORDER. THAT´S WHY JOHN SHOULD NOT DIE, TO REMAIN IN CONTINUITY IN THE WORLD UNTIL THE COMPLETE DEVELOPMENT OF THE RACE. HE WAS AND IS, LET´S SAY IT LIKE THIS, THE ACCUMULATOR OF ALL THE POWER OF LOVE, EXPANDED AND COLLECTED IN HIM, IN ORDER TO BE GRADUATED IN THE MANIFESTATION . IF HE WILL THEREFORE DESTROY JOHN, HE WOULD DESTROY ALL HUMANITY ! THIS IS ONE OF MANY MYSTERIES ON HIM. “I HAVE SAID AGAIN:”LATER THAT DESPOT, sensing the DIVINE POWER AND FEARING FOR HIMSELF, ‘relegated’ JOHN IN ONE OF THE SEVERAL ISLANDS OF THE AEGEAN, AND DIED VERY OLD. IN FACT, HE DIDNT DIE, THE WAY YOU KNOW IN YOUR WORLD, BUT HE STEP IN ANOTHER BODY READY FOR HIM, AND SO WAS ALWAYS, UNTIL THE COMPLETE DEVELOPMENT OF THE RACE WHICH IS NOW IN ITS EPILOGUE. 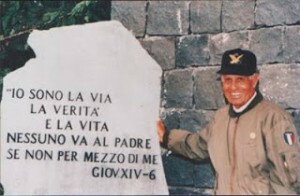 HE ALWAYS HAS BEEN THERE AND IS STILL NOW, IN THE SACRIFICE TO REMAIN ALWAYS ON EARTH WITHOUT THE POWERS THAT I CAN HAVE, BUT HE, ALWAYS GUIDED AND SUPPORTED IN ALL AND FOR ALL BY ME. I AM HIS ADVISER, HIS FRIEND, HIS BROTHER, HIS AFFECTIONATE AND LOVING FATHER, I AM ALL FOR HIM AS HE IS ALL FOR ME. 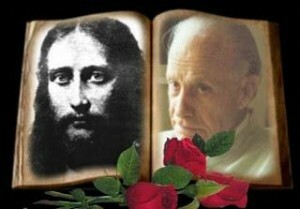 WE ARE ONE PERSON AND THE EFFECTS WON´T BE SEEN WHEN I SPEAK ‘WITH HIS MOUTH AND DO EVERYTHING I DID, WHEN I WAS JESUS ​​’. 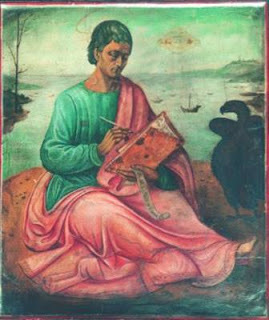 John the Evangelist is depicted in a painting of 1914, when he was on the island of Patmos, with the presence of an Extraterrestrial Space Ship. “THE SUN, SEEN FAR AWAY FROM THE STRATOSPHERE DOES NOT APPEAR MORE LIKE A FIRE, BUT WITH A GOLDEN MAGNIFICENT COLOUR. 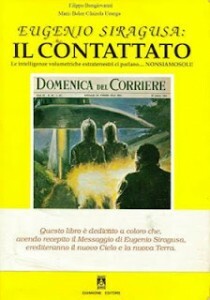 THE LIVING BEINGS THAT INHABIT THIS HUGE ASTRO ARE NOT TERRESTRIAL, BUT SPIRITUAL, TO THE POINT THAT THEIR ACTIVITY ARE ‘NOT’ MORE ‘SINGLE BUT BINARY OF CONSCIOUSNESS ACQUIRED THROUGH THE PILGRIMAGE IN ALL THE PLANETS, INCLUDING THE UNIVERSAL SUNS. THEY ARE, IN OTHER WORDS, HEAVENLY BEINGS WHO HAVE REACHED THE COMPLETE SPIRITUAL EVOLUTION IN UNION LOVE OF TWO TWIN SOULS IN ONE SPIRIT PURE REACHED WITH THE PERFECT AWARENESS OF THEIR INDIVIDUALITY ‘AND THE RECEPTIVE BINARY ABILITY OF THE CONSCIOUSNESS OF GOD , CREATOR AND FATHER OF ALL. THESE HEAVENLY BEINGS POSSESS THE ABILITY TO COMMUNICATE, IN CONTACT WITH OTHER SOULS IN EVOLUTION, A SENSE OF JOY AND HAPPINESS THAT PERVADES ALL BEING. THE RENEWAL OF THE WORLD WILL BORN IN THE SPIRIT OF JOHN. THE WITNESS THE DISCIPLE THE MESSENGER.